Every human pursues it. Every society has a different definition of it. The quest for happiness and fulfillment is one of the most universal human impulses. Although there is no single road to happiness, organizations like the TED foundation provide a platform for our generation’s greatest leaders, innovators, philosophers and researchers to share their experiences. TEDtalks are the famous output of this organization and aim to share meaningful ideas – many of which offer insight into this quest. The following TEDtalks discuss various ways of understanding, viewing and pursuing happiness, social change, and personal growth. While this is just a small sampling of the hundreds of delightful, free Talks available online, these are our top ten. While our picks range from the hilarious to the deeply moving, their goal is the same: to inspire. Researcher Brene Brown provides deep insight into whole-hearted happiness. By embracing vulnerability as a necessary component of happiness, Brown suggests we can feel love, passion, success, and connectedness more fully. By having “the willingness to say, ‘I love you,’ first, the willingness to do something where there are no guarantees, the willingness to breathe through waiting for the doctor to call after you mammogram, [or the willingness] to invest in a relationship that may not work out,” we can experience a range of emotions – both good and bad – worth celebrating as testament to our humanity and ability to be seen by others. In this short, five-minute video, stand-up comedian Ze Frank conducts a “human test” to determine whether or not you’re “normal.” He poses a series of questions ranging from the hilariously simple (such as, “Have you ever seemed to lose your airplane ticket a thousand times as you walked from the check-in to the gate?”) to the deeply personal and revealing. The result is a reassuring and touching affirmation that we all share the same joys and the same fears. In short, we are all much more similar than we might think. Harvard psychologist and author of New York Times bestseller “Stumbling on Happiness,” challenges how we pursue happiness. More specifically, he says the things we believe will make us extremely happy, are overrated in our minds, yet we pursue them anyway. He begins with an illustration between the long-term happiness of a paraplegic and a lottery winner, and then develops a theory around the effects of various positive and negative events that occur throughout our lives. The punch line is that how we synthesize fortune (and tragedy) can have a profound impact on our outlook and enduring happiness. Tony Robbins is a leadership and development coach, author, humanitarian and public speaker. 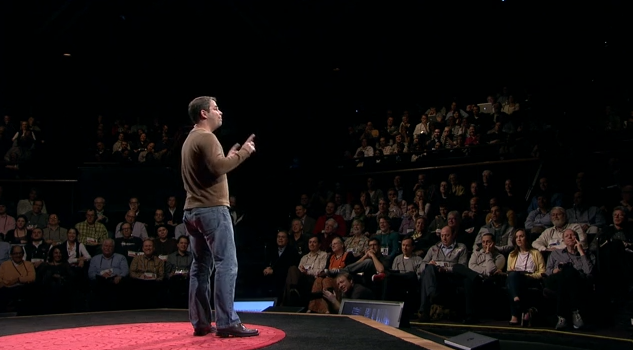 In his TEDtalk, he provides insight into how we succeed and what drives our happiness. He believes our model of the world influences our decisions and drives achievement. This model is made up of six human needs. The first four represent basic human needs, while the last two – growth and contribution beyond ourselves – represent the key to enduring happiness and success. In this beautifully simple TEDtalk, Benedictine monk, David Steindl-Rast explains that gratefulness makes us happy. The shift in perspective away from a belief that happiness makes us grateful can have a profound impact on our lives. Steindl-Rast prescribes a simple, “Stop. Look. Go.” mentality to slow down, look around, and appreciate the small and large blessings in our lives, as well as the hardships and challenges that make us more appreciative of these gifts. The acclaimed author of the international bestseller, “Eat, Pray, Love,” Elizabeth Gilbert discusses the unpredictable nature of the creative process. She acknowledges the natural fear that comes along with creating: “Aren’t you afraid you’re never going to have any success? Aren’t you afraid the humiliation of rejection will kill you? Aren’t you afraid that you’re going to work your whole life at this craft, and nothing’s ever going to come of it?” And how to overcome those fears to unleash your creative genius and – in short – just do the job you were put on Earth to do. Professor Dan Ariely proves that we are irrational creatures. Our vulnerability to optical illusions proves one of our strongest faculties – sight – is prone to failure. Why, then, are we surprised that our ability to make decisions (a far more volatile process) is equally faulty? While we grasp our physical limitations, Ariely challenges that we do not grasp our mental limitations, and that by trying to understand and embrace those limitations, we can create better systems and find better solutions to life’s challenges. In this TEDtalk, Google Engineer Matt Cutts combines the revolutionary tech company’s culture of innovation, Morgan Spurlock’s philosophy of trying something new, and his experiences into a challenge. The “30-Day Challenge” calls you to try something new for 30 days. By cultivating a series of new habits and taking on new passions, Cutts found a vehicle for sustainable personal growth. And challenges you to do the same. Steve Jobs’ famous Stanford commencement speech turned TEDtalk highlights the value in unabashedly pursuing our dreams, living life to the fullest and not being afraid to fail – or even die. Jobs’ inspiring speech captures the magic that drove him beyond success and continues to inspire graduates, philosophers, luminaries and in \novators years after its original delivery. Jobs speaks with candor about his journey as CEO of Apple and Pixar and the highs and lows that have made him legendary. Sociologist and philosopher Renata Salecl frees us from feelings of guilt, unhappiness and anxiety with the simple call to make decisions rather than becoming paralyzed by choice and the fear of what we “should” be doing. Borrowing a quote from Samuel Johnson, Salecl challenges the audience: “When making your choices in life, do not forget to live.” By doing so, Salecl believes we can begin thinking with a communal mentality that inspires real social change – not just for ourselves – but for the world.